Set aside the morning to spend some quality Mother-daughter time and celebrate Mothers day while learning a beautiful craft. The workshop is the day before Mothers Day so you can keep your crowns and look stunning the next day too. This workshop is perfect for girls who are aged ten and over. Can’t wait to meet you all! We’re super excited to host another workshop with Gordon Street Garage! It’s Mothers Day weekend so we thought you could make your mum a crown or bring her along as a mother daughter outing. Or just get the girls together and settle in for a beautiful afternoon designing your crown and enjoying the bubbles & canapés. Bring a bit of creativity to your morning this November! Learn the art of creating your very own flower crown while enjoying a glass of bubbles, feasting on delicious snacks & meeting new people. 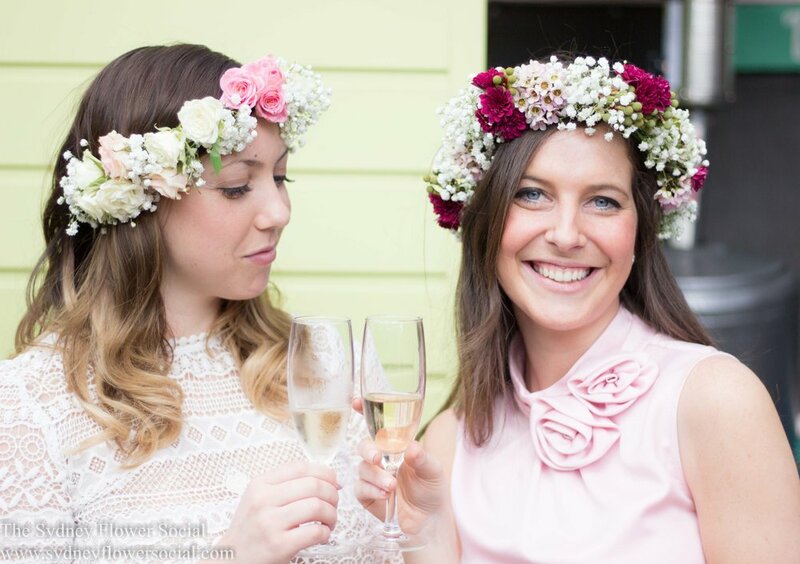 Flower crown workshop, glass of wine and grazing table at Paddock, Surry Hills. We're very excited to be running a Spring flower crown workshop in the courtyard of Paddock in Surry Hills! but this time we're donating all our proceeds to Melanoma Institute Australia. Did you know that Melanoma kills more young Australians (20-34 year olds) than any other single cancer? This charity is one close to the Flower Social family and we'd like to help raise awareness and funding for much needed research. We're looking forward to a great day playing with flowers, meeting some new friends and having a glass of bubbles in the sunshine. Please buy early to avoid disappointment! *No tickets sales on the day. Flower crown workshop, bubbles and canapés at Gordon St Garage in West Perth! We're looking forward to a great day playing with flowers, meeting some new friends and having a glass of bubbles. Please buy early to avoid disappointment! Flower crown workshop, bubbles and canapés at The Balmain Hotel in Balmain!